Minecraft uses an attribute system to handle important calculations. 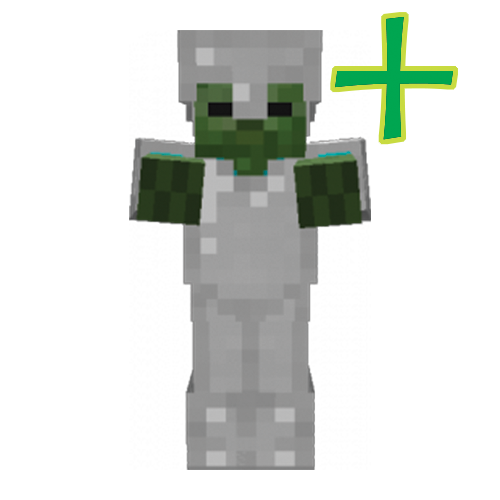 It covers everything from armor values, to attack damage, to the maximum health of a mob. This system also introduced attribute caps, which limit how high any value can be. While this usually goes unnoticed, many mods are unknowingly affected by it. One common example is a set of armor that provides the player with more than 30 points of armor. The vanilla game limits armor to 30 points, so any armor points above that are completely wasted. This mod significantly increases these caps to allow mods to work as they were intended. Fantastic mod! Deserves more downloads. Is there any chance in adding Saturation to that list? Saturation isn't an entity attribute. Is this client only? Server only? Required on both? It needs to be on both. Any mod that can affect your max health, attack damage, etc., also has to be installed on the server. Using the mod "No DamI" (https://minecraft.curseforge.com/projects/nodami) will cancel out the ability to exceed toughness higher than 30. If attempted (in IBE Editor for example), the game will crash once you click "Done". The damage is like poison; it's on a timer. Drinking milk or trying any other potion cures doesn't stop the damage. The only way to get it to stop is by doing /kill, but it will eventually come back when hit by a mob. This is using AF v1.0.4 or any newer version after that. I haven't tried with a version lower than that. Thanks for the comment. I don't think my mod would be responsible for this issue, as it just changes some max values in vanilla and doesn't modify the actual logic used for handling attributes. You could always try removing the mod and seeing if that fixes the issue. If removing this mod does fix your issue, then I think another mod has made an assumption about the max attribute values, and as my mod raises those max values it breaks there assumption. Unfortunately I can't fix their assumptions in my mod, so if this is the case your best bet would be to try and track down the mod that is actually responsible and give them an issue report. Wow. I had no idea this was a thing. I had wondered how I saw some server mods give out for example a luck 5000 level item to someone. They pop a diamond ore, get 3-4 stacks of diamonds. Would this alter any Tinker's Construct tools or armor? basically if you have 100 armor or enough toughness that either of them result in a value above 20 its not possible to block any more damage. This doesnt make it useless to have more armor since it will still increase its effect on damage values high in the sky, but as long as something deals more than 5 damage (unless my calculations are wrong) it will hurt a player even if the player had 100 armor or more, since 5 * (1-20/25) = 1 .
edit2: also just read in another comment that you mentioned all calculations were the same, so i guess i can be pretty sure about that. basically making it so that on armor alone its not possible to go higher than 80% reduction, which would make the incoming damage and the armor's toughness matter. But idk if that's something that would work on all mods/servers. Yes, there are some places where vanilla still limits the player, however this mod is more so about making the stats work better over all. For example, I have a mod which adds living armor and their armor value is their health. If you spawn it in using a higher armor value than 30, it's health would still be 30 without this mod. Mods like to use these stat values all over the place but unknowingly hit these limitations. So Bookshelf doesn't do this anymore? Or does bookshelf still do this as well, but you split it out for folks who for some reason didn't want bookshelf? Thanks! Your mods are great! Edit-Never mind, I see the answer in the bookshelf description. Yeah, I felt this change was better for the sake of transparency. Some people would download a mod like Dark Utilities and get Bookshelf, but may not want Bookshelf's features. Bookshelf right now is just a code library for other mods and doesn't come with any unexpected surprises for users. Add the radius of the attack. No, and that's not an attribute. Is there any reason I shouldn't include this in a pack other than it might not be utilized? This mod will not negatively impact the game, or increase risks of crashes.